Finding Silent in the Grave turned out to be one of those beautiful, stumbling across the perfect book to fit your mood moments. Here I am, staring down the barrel of this pregnancy, willing the last few days to pass faster, and this absolutely delightful Victorian mystery proves just the thing to take my mind off the all-too-slowly ticking clock. Even better, it's the first in a series with the second one already out and the third due to hit shelves in March. Silent in the Grave starts out with one of the best opening lines I've read in ages. Ha! Honestly, who wouldn't want to continue reading after that? Does she care? Does she not care? Is she as calm and composed as she sounds? And just who is this Nicholas Brisbane and why is he significant? You have to find out. Each question is answered, but slowly and carefully, spread across the rest of the novel. After her husband's untimely collapse, Lady Julia Grey finds herself a young and surprisingly wealthy widow. Having suffered from a heart condition his entire life, his sudden demise was not altogether unexpected. That's why, when confronted with an unusual and mysterious private investigator's claim that her late husband employed him to find out who was threatening to kill him, Julia dismisses the notion as preposterous and sends Mr. Nicholas Brisbane on his way. Nearly a year later she (naturally) comes across a clue leading her to believe dear Edward was, in fact, murdered. Managing to track down Brisbane, she apologizes and convinces him to reopen the case. Intrigue and mayhem ensue and it's all just perfectly delicious. I so enjoyed Julia and her measured narration, her bizarrely large but loving family, and her cautiously fresh observations on the world and the people around her. It is as though her husband's death removes a film from her eyes, and she is unnerved to realize she hardly recognizes where she is and who she has become. One of my favorite lines is Julia reflecting on her oldest and most pompous brother who is scandalized to hear she intends to manage her inheritance herself. He had nothing to call his own except dead men's shoes, and I think the highly Oedipal flavor of his existence sometimes proved too much for him. As you can tell, I was completely taken with the characters and Deanna Raybourn's well-paced writing style, both of which made for an incredibly absorbing, enjoyable read. I'll be picking up the sequel ASAP. 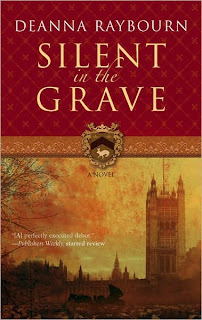 Recommended for fans of Laurie R. King's Mary Russell books. Thanks for the link to my review! I really need to hurry up and read the sequel myself! You're welcome, Marg! I enjoyed your review. I just started the sequel and it's good to be back with Julia and Brisbane again. I absolutely loved this book, too--the atmosphere is just perfect. I agree, Rachel. I keep coming back to it and how much I enjoyed it. Have you read the sequel?